More than 35 grants managers from around Florida came together online and in person on Thursday, April 17 for a webinar on this topic. The webinar was presented as a joint partnership between the Florida Chapter of the Grants Managers Network (GMN) and the Florida Philanthropic Network (FPN). Three presenters took the stage to explain best practices around gathering feedback and how the responses they have been able to gather through both formal and informal survey methods have had significant impacts on how they operate. First, the group heard from Amber Bradley, the Director of Assessment Tools at the Center for Effective Philanthropy (CEP). CEP, a leading provider of nonprofit assessment tools, works to enhance funders’ ability to be high-performing through the use of data. She explained how CEP’s signature tool, the Grantee Perception Report® (GPR) provides CEOs, boards, and staff with comparative data on grantee perceptions of funder performance on a variety of dimensions. Peer benchmarking is key to the survey and with a client base of more than 300 private, family, corporate and community foundations of all shapes and sizes, CEP is well positioned to help grantmakers to gather the information needed to drive change at their organizations. Next, Jon Sotsky, Director of Strategy and Assessment with the John S. and James L. Knight Foundation, shared with the group Knight’s experience using CEP’s GPR over the past seven years. By tracking the foundation’s performance against a specific group of its peers as well as its performance against itself over time, Knight has been able to take the feedback it has gathered to become more impactful and responsive to grantees. Jon noted how seriously both Knight staff and board take the data that is gathered, and addressing the areas of concerns that are raised is a top priority of the foundation. The feedback has led to a number of significant changes at Knight including the move to a new grants management portal (Fluxx), assignment of a designated relationship manager for each grant, and streamlined reporting processes. Finally, the group heard from Deborah Hessler, a long-time Program Officer with the Edyth Bush Charitable Foundation. She kicked off her presentation by commenting that the foundation does not issue grantee surveys for confirmation that “we’re doing a great job”. 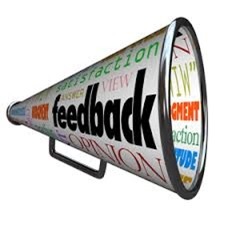 The foundation wants to gather feedback that will allow them to reduce the burden on their nonprofit partners and advises any funder who is considering engaging in this type of survey to “be prepared to change” upon receipt of feedback. Based on the feedback received through informal SurveyMonkey-type surveys as well as third-party consultants, the Edyth Bush Charitable Foundation embarked on what they call “the Grantee Conference” – all new grantees meet in person with the foundation to make introductions, discuss process, and lay out expectations and terms for the grant before any grant money exchanges hands. The speakers all acknowledged that engaging grantees as active partners in a foundation’s grantmaking is not easy but is an important step toward strengthening relationships with grantees and becoming more streamlined grantmakers. Gathering feedback on a regular basis and talking to your staff and boards about how to make change based on that feedback is the first step in this process. The next Florida Chapter Grants Manager’s meeting will take place on July 24, 2014, 12:30 – 1:30 pm with online and in-person options available. Contact Guenevere Crum (Guenevere@abletrust.org), Florida Chapter Regional Chair to learn more. This entry was posted in Evaluation, Florida Philanthropic Network, Grants Management and tagged Center for Effective Philanthropy, Edyth Bush Charitable Foundation, Grants Managers Network, John S. and James L. Knight Foundation by Florida Philanthropic Network. Bookmark the permalink.